Okyar is the director of digital payment products at BKM (Interbank Card Center). He is responsible for product management and marketing of digital wallet, BKM Express. His areas of operation also include tokenization and B2B payments. He has 15 years experience in software development, business development, product management and IT audit experience in banking, telecom and service industries. He holds a Ph.D. degree in Computer Engineering. 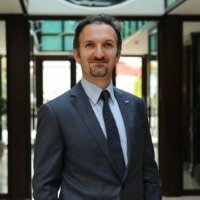 Before joining BKM he worked for Turkcell, the leading mobile operator and IsBank the biggest private bank in Turkey. Interbank Card Centre of Turkey (BKM) was founded in 1990, the company is a result of the partnership of 13 public and private Turkish banks that have come together to find solutions to common problems, and to develop rules and standards for credit and debit cards in Turkey. BKM is now moving forwards with a new strategy that brings advantages for customers and merchants. With partnership of all member banks BKM launched a digital wallet platform: BKM Express in June 2012. BKM Express makes e-commerce transactions easier, faster and more secure for cardholders. BKM Express allows cardholders to shop without sharing card numbers with virtual merchants on any merchant website and benefit from loyalty programmes, rewards, promotions and installment opportunities.